1860. Slips for raising and lowering vessels. 1869. 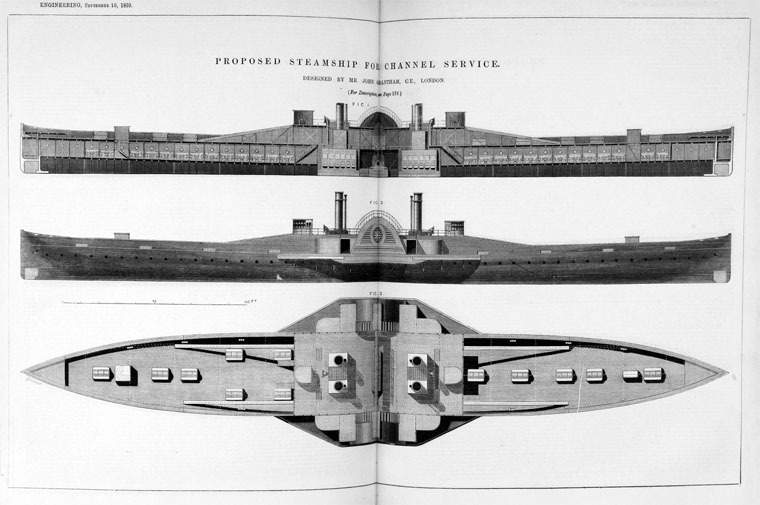 Proposed Steamship for Channel Service. John Grantham (1809–1874) was an English engineer, born at Croydon, who was involved in marine, railway and tramway engineering. He was the second son of another John Grantham. After leaving school, John (junior) worked with his father surveying routes for projected railway lines in England. Moving to Ireland, he assisted with the introduction of steam boats to the canals between Dublin and Limerick and to the River Shannon. Returning to England, he joined Mather, Dixon and Co in Liverpool and later became a manager and partner in the firm. 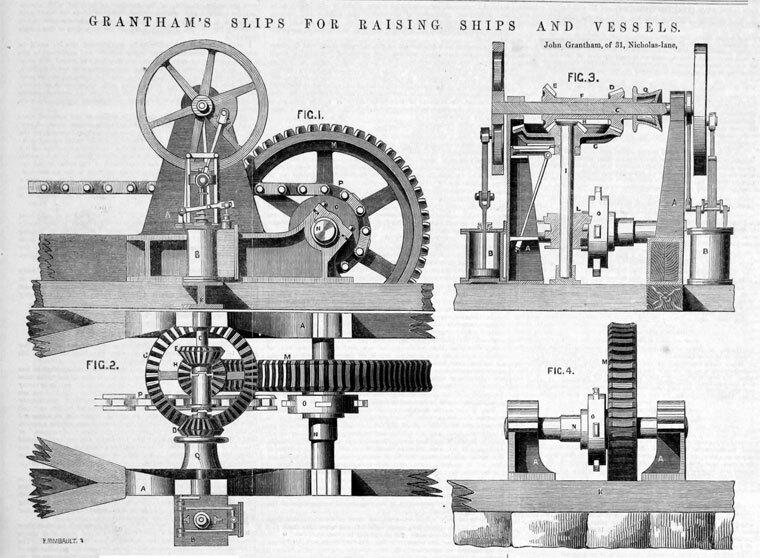 1843 Mather, Dixon and Grantham closed and Grantham began a practice as a Naval Architect and Consulting Engineer. He was involved in the design of several large iron sailing and steam ships, including Sarah Sands, Pacific, Antelope and Empress Eugenie. He became Engineer to the Whitehaven Steamship Co, and other companies, and was involved in the construction of vessels for Australia and Egypt. In 1859 he left Liverpool for London, where he continued to do work for the mercantile marine. In 1860, became Engineer to the Buenos Aires Northern Railway, Argentina. In 1863, he created the first tramway in Copenhagen, Denmark. In 1872 he designed a steam tramcar. 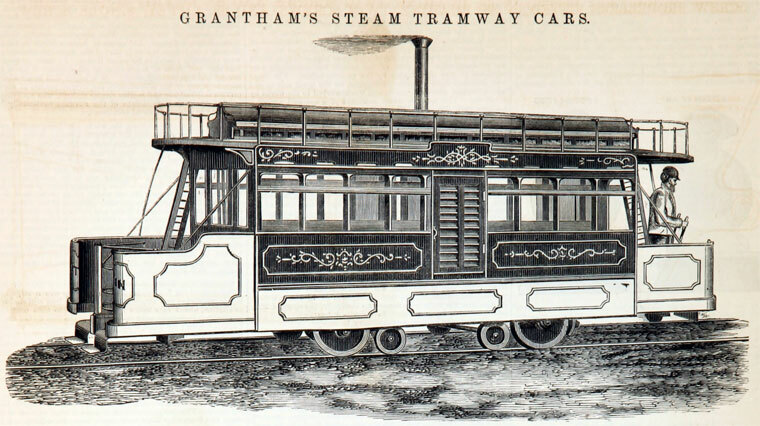 This was a four-wheel double-deck car with two vertical boilers in the centre. The boilers were of the Field type and each was 18 inches diameter and 4 ft 4 in high. The engine, placed under the floor, had two cylinders, each 4" diameter and 10" stroke. These drove a single pair of driving wheels, 30" diameter. The car could be driven from either end. The car was built in 1873 by the Oldbury Railway Carriage and Wagon Co and the steam machinery was supplied by Merryweather and Sons. The car was tried out in London, at West Brompton and in Vauxhall Bridge Road, but it was not a great success. Edward Woods modified it, by fitting a single Shand Mason boiler in place of the twin Merryweather boilers, and it was then used on the Wantage Tramway from about 1876 to 1881. The car re-appeared on the Portsdown and Horndean Tramway about 1903 and was derelict when that line closed in 1934. MR. JOHN GRANTHAM, the second son of the late Mr. John Grantham, who was for several years engaged under the late Mr. Rennie in surveying any great works both in England and Ireland, was born at Croydon in 1809. After leaving school, he was engaged with his father in surveying various lines of railway then projected in England, some of which were eventually carried out. He also assisted in the establishment of steam vessels and an improved system of navigation on the canals between Dublin and Limerick, and in the employment of steam on the river Shannon, which system was subsequently taken up by the City of Dublin Steam Packet Company, and continued until the competition of railways diverted the traffic. Upon leaving Ireland, he, on the introduction of the late Charles Wye Williams, Assoc. Inst. C.E., with whom he resided in Liverpool, joined the late firm of Mather, Dixon and Co., of which he was subsequently manager and partner. In that establishment were constructed large mechanical works, such as marine engines, locomotives, sugar-mills, and nearly every kind of machinery. 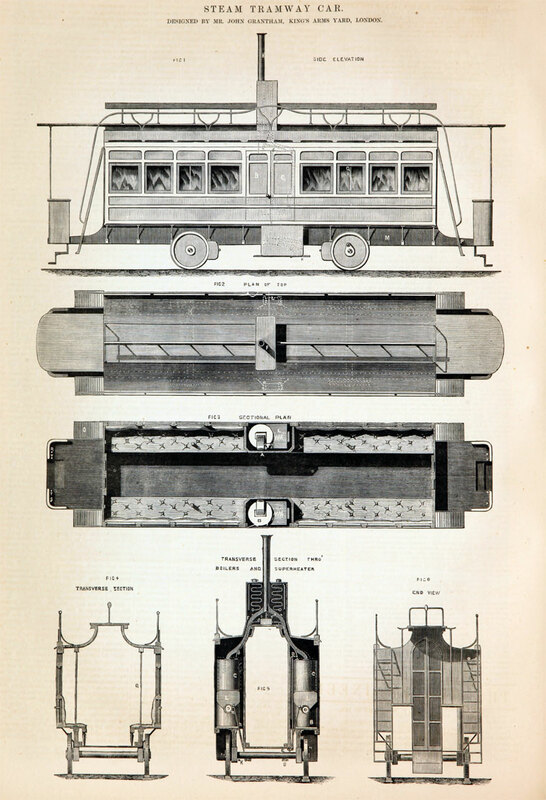 In the year 1830 he gained the prize offered by the London and North-Western Railway Company for a design for drawing up, by means of stationary engines, the passenger carriages from Lime Street to Edge Hill Station, Liverpool, which engines are still at work for some purposes, though locomotive power has generally superseded them. Mr. Grantham was one of the founders of the Polytechnic Society at Liverpool, and continued an Honorary Member till his death. The firm of Messrs. Mather, Dixon, and Co. having ceased to carry on business, he began practice on his own account at Liverpool as a Naval Architect and Consulting Engineer, and planned and executed several of the largest iron sailing and steam ships then employed in navigation, such as the 'Sarah Sands', 'Pacific', 'Antelope', 'Empress Eugenie', &c.
He was Engineer to the Whitehaven Steamship Co and other companies, for whom he constructed vessels for Australia and Egypt. He took out several patents for screw propellers, which were then being introduced, and invented a system of sheathing iron-built ships with copper, which was afterwards employed by the Government, but without recognition or compensation. He held for some years the appointment of Surveyor of Passenger Steamships at Liverpool under the Admiralty, and subsequently under the Board of Trade. In 1859 he left Liverpool for London, and was largely engaged in arbitrations and consultations in cases connected with insurance and casualties of the mercantile marine, and relating to the construction of vessels: He designed n fleet of steam colliers, which ply between London and the north of England. In connection with his brother, he, in 1860, became Engineer of the Northern railway of Buenos Ayres ; and, in 1863, planned and executed the first tramway in Copenhagen, which is now working with success. 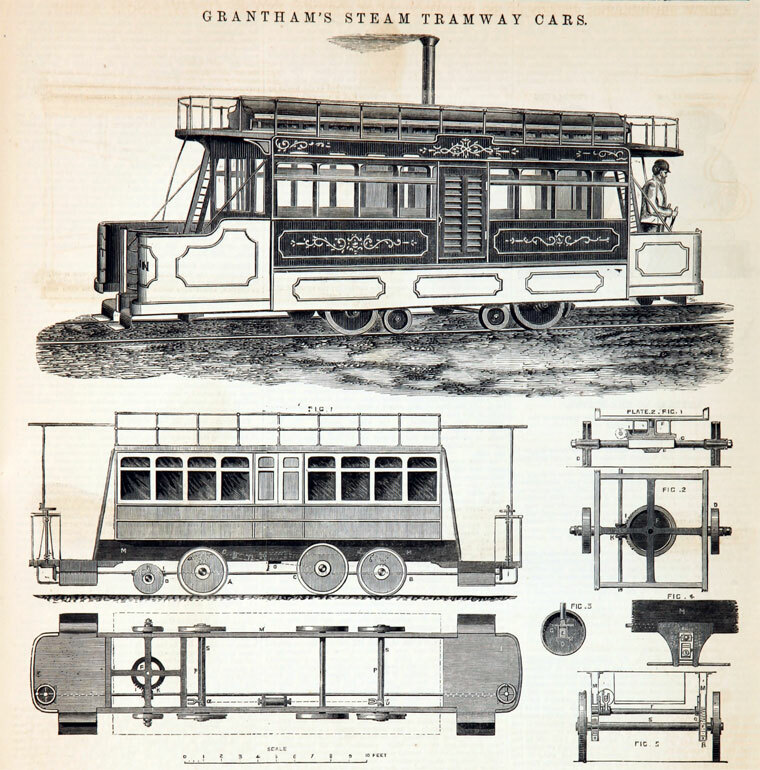 The latter part of his life was much occupied in the invention and perfection of a steam tramway car, which has been successfully tried, and for which he held a patent; but as the law of this country prohibits the use of steam carriages on public roads, except, under such restrictions as to render their general employment impracticable, it has only hitherto been worked experimentally. In foreign countries, however, where no such impediments obtain, a field appears to exist for the employment of this machine, which is noiseless, and does not differ in general construction from the ordinary tramway car, while it can be worked at one-half the cost of horse power. Mr. Grantham contributed many works to engineering literature, notably a memoir 'On Iron Shipbuilding,' and papers to several scientific societies. To the Institution of Civil Engineers he presented communications 'On the Stationary Engines at the new Tunnel on the Liverpool and Manchester Railway,' at Edge Hill ; an 'Account of some Experiments on a Vessel called the Liverpool Screw,' which he constructed; a 'Description of the Vanguard iron steam-vessel, after being ashore on the rocks in the Cove of Cork;' ;Description of the Sarah Sands, and other steam-vessels, fitted with direct-acting engines and screw propellers, without intermediate gearing;' and 'Ocean Steam Navigation, with a view to its further development,' which last embraced the most important features of an extended view of steam communication by sea, comparing the working of several vessels as to speed, expenditure of fuel per indicated HP., and discussing the bearing of the opening of the Suez Canal on ocean steam navigation. For this Paper he received a Telford Premium of books. Mr. Grantham was one of the founders of the Institution of Naval Architects, in January 1860; he was placed on the Council, and remained there until his death. He communicated several Papers to the Institution, and took an active part in its management and proceedings. Mr. Grantham was elected an Associate of the Institution of Civil Engineers on the 11th of February, 1840, and was transferred to the class of Member on the 29th of November, 1864. He latterly resided at Croydon, where he died on the 10th of July, 1874, at the age of sixty-five, deeply regretted by a large circle of friends, and universally respected for his exertions in support of the charitable and educational institutions of his native town. This page was last edited on 27 March 2019, at 11:46.